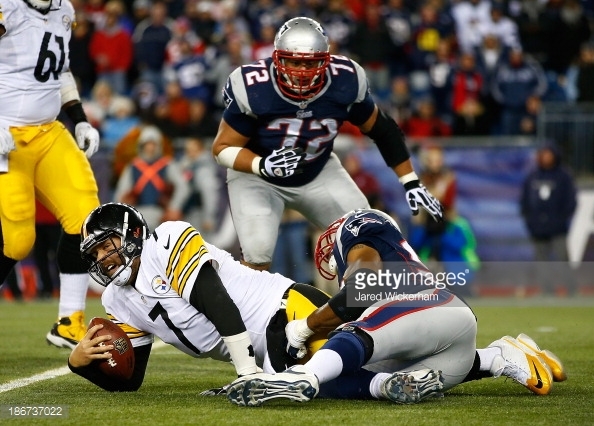 Week 1: Patriots vs. Steelers Preview | NFL News, as it happens, when it happens. Your one stop shop. There’s no better way to start the 2015 NFL season than pitting two classic franchises against each other on Thursday Night Football. The Pittsburgh Steelers will have their hands full defending the reigning New England Patriots, but don’t expect this to be a blowout by any means. Let’s break it down and see what each team is bringing to the table. Two words: Tom Brady. Need I say more? The return of the veteran quarterback has been the talk of the NFL, and people are expecting a huge game from him. Brady will be throwing to familiar receivers Edelman and Amendola, though Edelman may have limited receptions due to his ankle issues. Brady’s most important weapon, Rob Gronkowski, is healthy and ready to play week 1 (a rarity for the monstrous tight end). The suspension of LeGarrette Blount and the recent loss of center Bryan Stork will hurt what run game the Patriots had, but it’s safe to say Brady will be airing it out all game long regardless. And why wouldn’t he? The Steelers have an extremely weak defense right now. It’s going to be target practice for Brady against a secondary riddled with injuries and stitched together by backups and low round draft picks. The only defensive back who may pose a threat is Brandon Boykin, a strong slot corner who will most likely be working against Edelman and Amendola. The defensive front is just as bad for the Steelers. Their only redeeming player is the impressive pass rusher Shaq Mason. Should the left guard be able to contain Mason, though, Brady will have a clean pocket to throw from all night. Leading the Steelers is Ben Roethlisberger, another veteran quarterback who can still throw with the best of them. Roethlisberger has one of the best receivers in the game in Antonio Brown and should be giving him plenty of targets all night long. The suspension of Martavis Bryant, however, will limit the talent Big Ben has to throw to. Top running back Le’Veon Bell is also suspended and will be replaced by Deangelo Williams. Williams won’t have any trouble running the ball, but don’t expect an overly productive run game. This is especially true because of the loss of Maurkice Pouncey, the Steeler’s best offensive lineman. Even with a strong passing attack the Steeler’s offense is outmatched by the Patriots defense. New England may have the most stacked defense in the league, and this comes after losing three of their starters at the end of last season. While there are still many questions waiting to be answered about the Pats secondary, it’s safe to say the front seven will be dominating this game. Pass rushers Ninkovich and Jones will be getting to Roethlisberger, while run stoppers Easley and Brown should be negating any rushing attempts. Add to the mix the best linebacker squad in football and Big Ben and the Steelers are looking at a very rough Thursday night. I see this game being close for a while until the Patriots pull away late in the third quarter. The Steelers will no doubt have a great offensive night, but the strength of the Patriots defense coupled with Brady’s rage being thrown at Pittsburgh’s secondary is enough to turn the tide. Regardless of the outcome, football fans should be ready for a great opening game to 2015 NFL season.